Most people can imagine only in dumpsters. However, maggot debridement therapy is rising in popularity as a safe and effective way to get rid of dead tissue and promote the growth of healthy granulation or scar tissue. Maggot debridement is an attractive treatment option because maggots used for clinical purposes eat only dead tissue and leave living tissue intact. All other debridement procedures inevitably destroy some living tissue needed in would healing. Moreover, such procedures can be pretty uncomfortable, and surgery specifically requires general anesthesia which carries its own risks. In other words, with maggot debridement, the patient loses no healthy tissue and doesn't need to undergo anesthesia. Maggots used for debridement must only digest dead tissue. (Some species of maggot eat both live and dead tissue and are thus unsuitable for use as medical treatment.) For example, Lucilia sericata or the green bottle blowfly is a commonly used species of medical-grade maggot. In addition to debriding or clearing away dead tissue, recent studies suggest that the secretions of maggots may help mitigate the inflammation and destruction of living tissue thus protecting the fragile wound bed which is needed to help form scar tissue. There's nothing new about maggot therapy. For centuries, physicians on the battlefield have noticed that wounded soldiers who were infected with maggots healed better. During the 1920s, William Baer at Johns Hopkins University used laboratory-raised maggots to treat children with osteomyelitis (bone infections) and soft tissue infections. Consequently, using maggots to debride wounds became popular in the 1930s, with thousands of procedures formed. However, the advent of antibiotics and surgical advancements supplanted the use of maggots which then languished as a measure of "last resort." 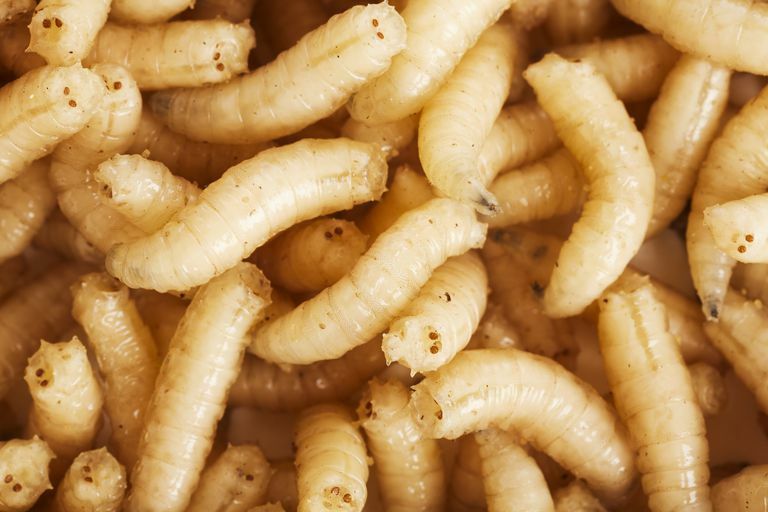 By the 1990s, interest in the use of maggots as medical treatment for wounds resurged. A growing body of research suggested the benefits of maggot debridement therapy as an earlier-line treatment in wound care, and by 2004, the FDA approved sterile maggots for use in healthcare settings. In 2008, an estimated 50,000 people across the world were treated with maggots for wound debridement. Of note, people on anticoagulation therapy (i.e., blood thinners) should be carefully considered as candidates for therapy with maggots because maggots can cause bleeding. Depending on the size of the wound, anywhere between 50 and 1000 medical-grade maggots are applied to the wound area for two or three days and enclosed (isolated) in a wound dressing. Most people need only two or three rounds of treatment, but people with more severe wounds may need five or six rounds. A typical endpoint for treatment with maggots is visualizing a clean wound base. Common adverse effects of maggot debridement therapy are typically tolerable and include pain, discomfort, and minor bleeding. For instance, analgesics or pain relievers are often given for pain. If you or someone you love suffers from chronic ulcers or other wounds that are amenable to maggot debridement therapy, if it's presented as a treatment option, it may be a good idea to consider this treatment. No one is going to deny that maggots found in the trash are "yucky" and disgusting. But maggots bred in the lab are dynamic, precise, mobile, flexible, tiny surgical machines that facilitate recovery. In fact, debridement with maggots is sometimes referred to as biosurgery. Iserson KV. Chapter 22. Wounds and Burns. In: Iserson KV. eds. Improvised Medicine: Providing Care in Extreme Environments. New York, NY: McGraw-Hill; 2012. Marineau ML, Herrington MT, Swenor KM, Eron LJ. Maggot debridement therapy in the treatment of complex diabetic wounds. Hawaii Med J. 2011;70(6):121-4. Pfenninger, JL, Fowler, GC. Maggot Treatment for Chronic Ulcers. In: Pfenninger and Fowler's Procedures for Primary Care. 3rd ed. Philadelphia, PA: Elsevier Saunders; 2010.
van der Plas, MJA et al. A Novel Serine Protease Secreted by Medicinal Maggots Enhances Plasminogen Activator-Induced Fibrinolysis. PLOS ONE. 2014. 9(6):e101646.